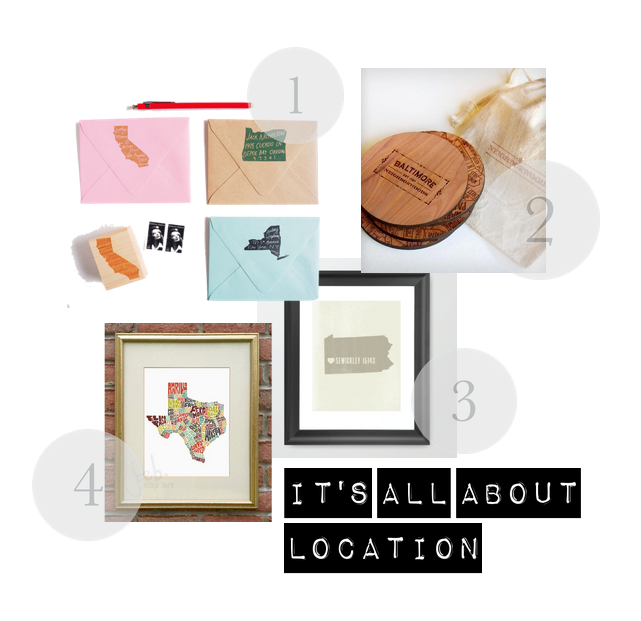 A fun and personal gift for anyone is something to remind them of their hometown, vacation spot, or location of their first date. Try a location gift. 1. Home State Stamp: I love this gift for someone who just bought their first place, rented their first apartment or a newlywed. 2. City Coasters: I have bought these more than once. Each coaster is different and there are a bunch of major cities to choose from. 3. Home Town: How sweet is this simple print. Pick the town and zip code and hang it anywhere. 4. Typography Map: A fun and colorful way to illustrate your home state. I love all of these hometown gift ideas! Those coasters and prints are adorable. I might add a few of these to my gift-list this year -- thanks for sharing! Might need to pick up a few of these as gifts for Cindy. The location might need to be here imaginary lake house in NH!